These days with our busy working lifes and long working hours, the first thing you want to do when you get home is get a quick shower walk into the living room and put your feet up and watch TV. That is the dream for many of us, however most of us share our homes with our family too. So in order to seperate one room from another or the home theate room from the bedroon. We need soundproofing in our room. Room Soundproofing is not as exspensive as you might think, and more importantly it dependants of what you want to soundproof your room for or against? If you have a noise neighbour upstairs then you need to focus on soundproofing ceilings. Some people have noise coming from the nextdoor neighbour playing his music too loud and such you would need to do soundproofing to your wall. In a lot of cases soundproofing rooms means the bedroom, it means getting a good nughts sleep, you should be able to relax in your room? If your room is noisy and irritating you can never feel peace in your room. 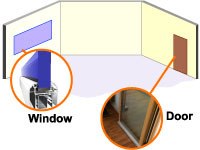 Soundproofing rooms for the majority of people is soundproofing of your windows and your doors, not everywall or ceiling and floor but the parts where the noise is entering the room. 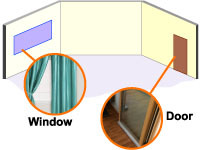 By treating the door and window the noise levels in the room will drop by significant amounts creating a quiet and peacefull living space in your room. This exact system has been installed 528 homes in Singapore alone.